One of the unsung heroes of an anaerobic digestion plant is the silage clamp storage, so in the video embedded on this page we provide our, and silage clamp expert Bock’s, top 10 silage clamp tips. These are tips for the care and legally compliant operation of AD feedstock storage in the UK, in accordance with the Defra SSAFO regulations. Each of the 10 tips is listed and explained in the video below. Watch our video presentation and afterwards return for more information about Anaerobic Digestion Plant SSAFO compliant silage clamps and Bock’s service. 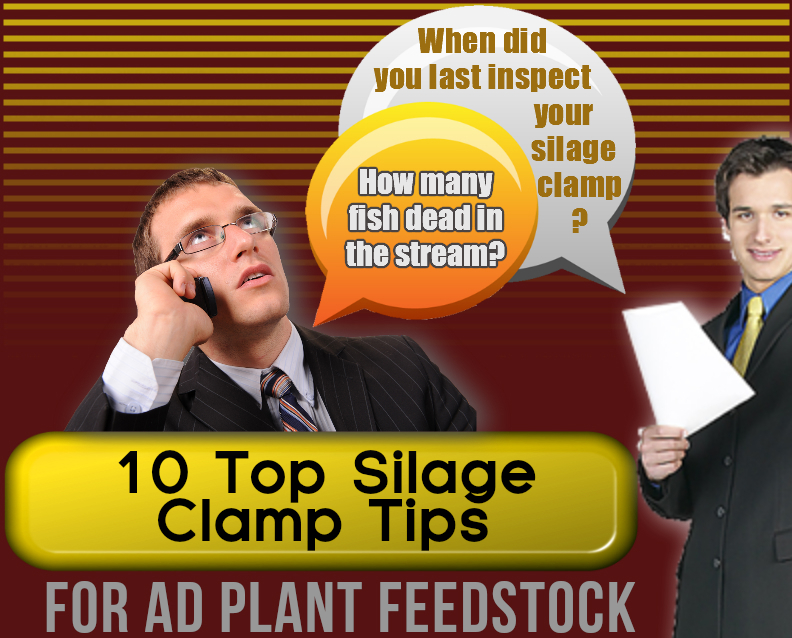 What is a Silage Clamp? Silage is grass or other crops which are cut fresh and packed in a large volume in a pile, or “clamp”. The pile is in effect pickled in its own juice. by sealing out the air, and it does not rot or compost. The silage is formed either in big bales which are carefully covered completely in a sealed plastic bag or wrapper, or in a “clamp”. Both, are used by the operators of anaerobic digestion plants, and they provide an invaluable year round feedstock for a biogas digester. No biogas digester runs well on stop-and-go feeding, nor do the bugs in any digester like to be fed by a rapidly changing biomass. An experienced biogas plant operator constantly seeks to adjust the feedstock of the plant by juggling feed materials to keep the input of feed biomass as constant as possible. The continuity of provision of major nutrients is just one of many of the qualities of a digester feedstock which needs to be considered and balanced so that changes are slow.Shock feedstock loadings are studiously avoided. 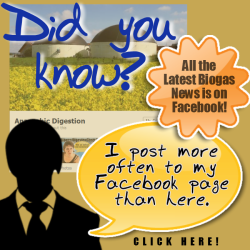 It follows that anaerobic digestion plants can only work well, given that many of the feed materials are seasonal (and may vary even load by load for, say a Food Waste Digester), if they can smooth out feed quality fluctuations. This is done by augmenting the feed from a large reservoir of feed biomass which is held in the silage clamp. This is where silage clamps come into their own, and the importance of a large and well-run silage clamp is now being increasingly appreciated by the anaerobic digestion industry. Many farms have possessed a silage clamp for a long while. Usually these were used for winter feed for the stock on the farm. They frequently had walls made from girders and railway sleepers, a perimeter leachate collection drain, and a sealed concrete base. This is now changing for the current large anaerobic digestion plants, which need highly engineered silage clamps of a much larger scale than previously. Then, as now, after cutting the silage-grass (or a crop such as maize) is put in and it is sealed by covering it with a plastic sheet weighted down, usually by worn-out car tyres. Silage clamps produce a juice which is called silage liquor or leachate, from the stored materials. Any excess juice that may drain out during this process is called leachate effluent. This is traditionally collected in a tank and is spread out on the fields with care that it does not enter groundwater, or flow into any watercourses. Field spreading has been used for silage leachate disposal on farms because it can be a powerfully polluting if deposited in large quantities. At anaerobic digestion facilities the liquor (leachate) is an additional feed biomass material for the digester, so there is no need for spreading on the fields to dispose of it. In that way the hazard of liquor escape is reduced, but on the other hand, anaerobic digestion plant silage clamps are now so large that ever-greater care is needed to ensure that even a very small proportion of that leachate liquor never escapes. Escape of the liquor can rapidly de-oxygenate watercourses and kill the ecology of the watercourses affected. So, extreme care is needed to look after these large AD plant silage clamps successfully. Never forget that a prosecution of a landfill operator for causing a pollution incident would mean receiving a criminal record, under UK environmental law. The SSAFO regulations are compiled in a manner so that by complying, the farm or AD plant operator will reduce the risk of causing a pollution incident. They also allow the environmental regulator to make inspections which are designed to identify non-compliance’s, and through corrective action by the farm or plant operator, to prevent pollution incidents occurring. Anaerobic digestion plant owners and operators need to take SSAFO compliance seriously, and remember that the UK EA will, and does prosecute a number of framers and biogas plant operators each year for non-compliance with these regulations and pollution incidents. Bock UK is a joint venture between German company Bock GMBH and Essex-based Milbank Concrete products. We supply patented, sloping walled silage clamps and high quality covers to the anaerobic digestion industry, as well as dairy and livestock farmers. Our aim is to help our customers achieve the best possible silage quality through design, quality and innovation. Bock UK can provide all the knowledge from three decades of German research and the support of Milbank Concrete Products – one of the UK’s largest precast concrete manufacturers. Visit Bock-UK for more information about Bock’s service. Hi! We started our business in Germany but just last week we have been to a fair in the UK for example, where people are very interested in anaerobic digestion. we are building plants in Italy, the Netherlands and in Czech Republic. You are making this too complicated. Go green easily by keeping your home clean at all times. By constantly cleaning your home, you aren’t allowing dirt to accumulate, which if left alone, you would need to use products with harsh chemicals to clean up. The less often you have to use these environmentally damaging products, the better off everyone will be.